The Animal Care & Use Program fosters a culture of excellence, compassion, and adherence to the highest standards of animal welfare in the conduct of research, testing, and teaching at the University of Michigan. For decades, laboratory animals have been essential to almost every major advance in human and animal medicine. The University of Michigan community is committed to the highest standards of excellent and humane care in the use of these animals in its research, and we believe that this commitment is central to the rigor and impact of our work. Our approach goes beyond strict adherence to all required guidelines. In addition, we embrace the principles known as “the three Rs”: reducing the number of animals used to the minimum required for the study, replacing animals with less sentient or non-animal models whenever possible, and refining all practices to provide the best animal welfare possible. Through projects and training activities that span a wide variety of fields, including medicine, dentistry, natural resources and the environment, engineering, public health, and kinesiology, scientific and medical knowledge developed through animal research has saved countless lives and improved health outcomes for both humans and animals. Some examples of life-changing research projects and teaching programs at the University of Michigan are highlighted in the stories below. 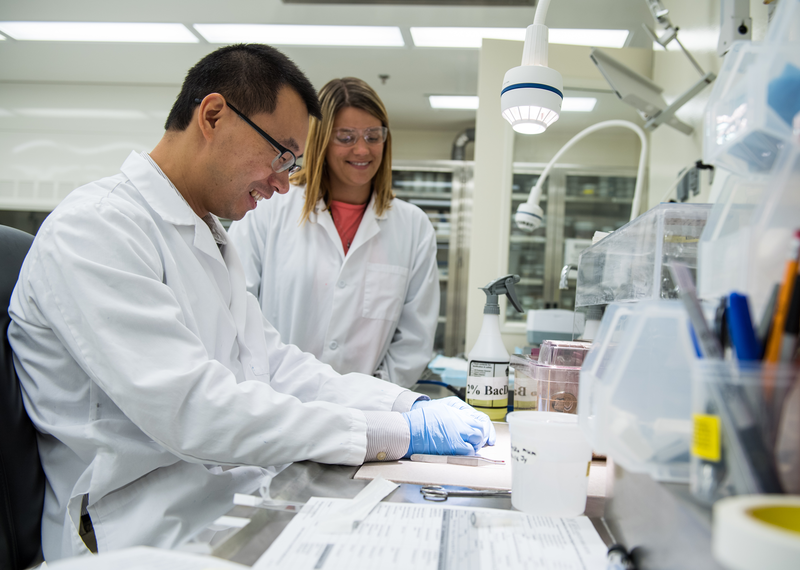 In a surprising finding, researchers from the University of Michigan Rogel Cancer Center have shown that knocking out NLRP6, a protein that plays a protective role in other diseases, led to better outcomes and less-severe symptoms after bone marrow transplants in mice. To better understand the role that sleep plays in the formation of new memories, an international team of researchers designed a new study to monitor the brain activity of sleeping rats after they completed a new maze. Published in the Journal of Neuroscience, the team discovered that the process of ‘replay’ may help cellular consolidation and trigger memory transfer from the hippocampus to other brain regions. Methicillin-resistant Staphylococcus aureus, also known as MRSA, has occasionally been known to cause life-threatening infections. In a study published in the journal Cell Host & Microbe, Michigan Medicine researchers share how mouse models helped them discover the important role that mitochondria play in supporting the immune system’s response against MRSA infection. As a public institution and an accredited site for animal use, we are open to inquiries, reports of concern, or other communications from within and beyond the U-M. Questions about the care and use of laboratory animals at the University of Michigan should be directed to acuoffice@umich.edu.